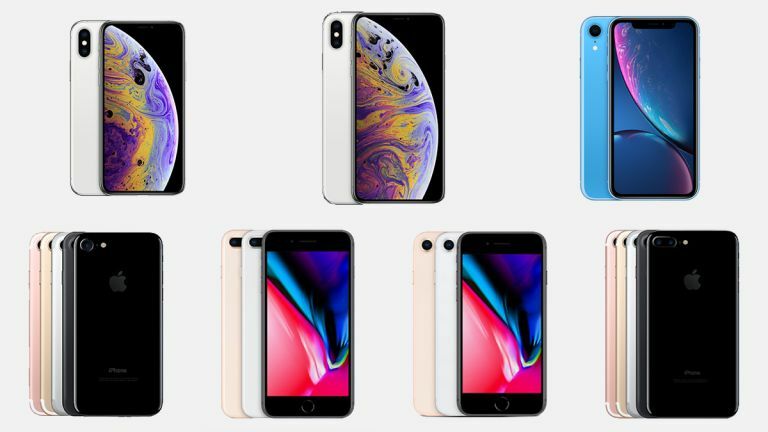 Head over to the Apple Store, and you'll notice to the Cupertino company is selling a total of seven different iPhones at the moment – so what are the differences between them, and which one should you be buying? We're here to help you with both of those questions. From the top-end, newly unveiled iPhone XS and iPhone XS Max, to the iPhone 7 and iPhone 7 Plus from 2016, we've ranked all of the phones you can currently pick up from Apple, from those we're least enamoured by, to our number one pick right now. A couple of caveats to begin with though: first, all of these phones are very good buys, even the ones we've put near the bottom of the list, and second, everyone's mileage is different. Different handsets will appeal to different buyers, so bear that in mind. The iPhone XS Max is the biggest and most expensive of the new iPhones that Apple unveiled this year, and that tells you all you need to know: it has the lightning-fast A12 Bionic chip, the dual-lens rear camera, and Face ID that's snappier than ever before. If your hands can live with that spacious 6.5-inch screen, and you have the budget to be able to afford it, this is the ultimate in iPhone gadgetry right now. It's certainly an expensive iPhone, but this handset has enough power under the hood to last you for years. The rumours are that Apple itself is expecting the iPhone XR to be the biggest seller of the 2018 iPhones, and it's not difficult to see why – for £250/$250 less than the XS phones, you get a lot of the same specs, more colours to choose from, and of course the same software. The screen tech is LCD rather than OLED, and you have to make do with a single-lens rather than a dual-lens rear camera, but it's still a great camera by all accounts. We think those compromises are worth the price savings, making this the second-best iPhone now. Identical to the iPhone XS Max except for the size, the fact that we've put the iPhone XS third shouldn't put you off buying it: it has the best iPhone camera ever, the fastest iPhone specs ever, and the screen is a very finger-friendly 5.8 inches from corner to corner as well. The iPhone XS Max is just more of everything, while the iPhone XR looks like slightly better value, so the iPhone XS sits in third. Compared with the now retired iPhone X, Face ID is faster, the specs are improved, and the camera optics have been given an upgrade as well. You may well have your iPhone 7 Plus vs iPhone 8 Plus arguments, and we're happy to hear them, but the 2016 phone starts at £130/$130 less than the 2017 version – that's a lot more money for a phone that's only slightly better and runs the exact same software. So the iPhone 7 Plus takes fourth spot for us, with its dual-sensor camera (for 2x optical zoom), waterproofing, and nippy performance. Yes, the iPhone 8 Plus (see below) is faster, but we don't think the improvements are dramatic enough to justify the additional price. We said it's a tight call between the iPhone 8 Plus and the iPhone 7 Plus, and this phone has a better camera and improved innards – in terms of internals it's level with the iPhone X – but right now we think the older iPhone 7 Plus offers slightly better value for money. Nevertheless, the iPhone 8 Plus is still a fantastic phone: if you can live with those chunky bezels, it may be a better bet for you than some others. You get a couple of extra camera tricks (like 4K 60fps recording), and the camera sensors are specially optimised for AR. The same arguments for the iPhone 7 Plus vs the iPhone 8 Plus apply for the iPhone 7 vs the iPhone 8. This time the difference in the starting price is £150/$150, and we think that just about sways it in the favour of the older iPhone, though again it's a very close call. This is the cheapest iPhone, but it still feels like a premium-level Apple handset, so if you want a compromise between price and performance, it's ideal. Remember that you'll have to live with a single camera lens and a smaller screen than the Plus models offer though. There's nothing essentially wrong with the iPhone 8, but the more expensive iPhones are worth paying more for, and it's not all that much better than the cheaper iPhones in Apple's line-up, putting it in something of an awkward position in the middle of the range. Of course you still get all the goodness of iOS 12, and a great (single lens) camera, and if you prefer to use your phone one-handed then it's a great option. It also has the excellent, super-powered internal components of the iPhone X for some lightning performance. Should you be upgrading to Huawei's newest Pro phone? Sony Xperia 1 vs Sony Xperia XZ3: is it worth the upgrade?